The headline sounds like a new Green Lantern superhero adventure movie but this place is just about an hours drive from the Gold Coast and a left hand turn at Beaudesert. We arrive in the Lost World Valley. It is on the northern most rim of what’s called the Green Cauldron. 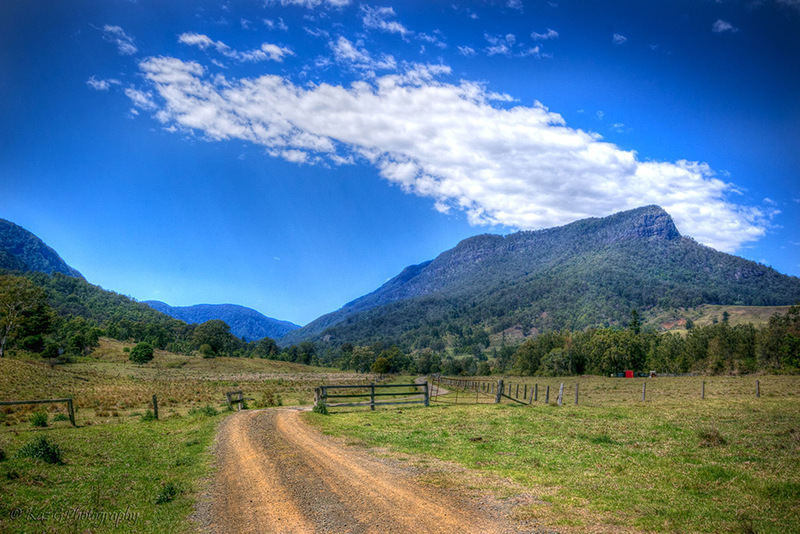 Lost World Valley abuts Lamington National Park on two sides. There are really two roads into the valley, both petering out into dead ends and dirt roads onto properties. There are also two creeks that meander back and forth across the path of the roads at numerous points with crystal clear running water. One is Albert Creek and the other Christmas Creek. At the moment it is a lush green valley with rolling hills. There are a smattering of B&Bs, farm stays and even a luxurious tent resort for the more adventurous. Here you can take horse back rides or just relax by the creek. Its a “get back to nature” kind of place. Its Australia at its finest and sometimes harshest when in drought. There are a lot of sheep and cattle properties out this way as well as farm land and dairies. In the afternoon we saw quite a few kangaroos or wallabies, I wasn’t too sure which but we had to keep an eye out as they can dart across the road quite quickly, having no road sense whatsoever. Its nice to think that only a short trip away from the cement city that is the Gold Coast, you can find such beautiful vistas and typical “country”. Walk around Mount Warning (Wollumbin) in Australia’s Green Cauldron – the remnants of an ancient shield volcano that is now a living Gondwanan rainforest. This vast caldera stretches from Byron Bay to the Gold Coast and west towards the Great Dividing Range. My Favorite is Surface Paradise! It looks so beautiful. Love the Gold Coast, but never went “back there”. Definitely a must when up there next time! Looks like a great place to take photos. I love taking photos in places like that. Great shots Karen. Thanks John, I appreciate your comments 🙂 It was a glorious place to visit I have to say. Beautiful countryside and lovely photos. Thank you Karen. I hope rather sooner than later i can afford a trip there. Its a wonderful place. Thank you so much I will do it would be awesome! I love these tours of Australia!! Beautiful photos Kaz! !